WASHINGTON, D.C. -- In an era of increasingly tense U.S.-Russian relations marked by allegations of Russian meddling in U.S. elections, Americans believe it is more important to try to continue efforts to improve relations between the countries (58%), rather than taking strong diplomatic and economic steps against Russia (36%). Gallup asked a similar question in 1994, when an even larger margin preferred improving relations with Russia over sanctions, 76% to 20%. That poll was conducted after former CIA agent Aldrich Ames and his wife were arrested on charges of spying for Russia. Ames was later convicted of espionage. The current poll, conducted Aug. 1-12, comes against a backdrop of concern about Russian interference in U.S. elections. In a July summit with Russian President Vladimir Putin, President Donald Trump appeared to dispute the U.S. intelligence community's findings that Russia attempted to influence the outcome of the election. Meanwhile, independent counsel Robert Mueller is investigating possible collusion between Russia and the Trump campaign. Two-thirds of Americans say they are following the news about Russia and the 2016 U.S. presidential election closely, including 33% who say "very closely." That is slightly above the average 60% level of attention paid to more than 200 news stories Gallup has asked about since 1991. Three-quarters of both Republicans and Democrats say they are following news about Russian involvement in the 2016 election very or somewhat closely, but Democrats are somewhat more likely to say they are following it "very closely," 42% to 33%. Independents are paying less attention: 59% are following it, including 28% who say very closely. Seventy-five percent of Americans think Russia interfered in the 2016 U.S. presidential election, while 16% say it did not interfere. Those who think Russia interfered are about equally split as to the effect -- 36% say Russia interfered but it did not change the outcome, while 39% say it interfered and its actions changed the election outcome. A slim majority of those following the news about the 2016 election very closely believe Russia interfered and it changed the outcome of the election. Most of the rest, 39%, believe Russia interfered, but it did not alter the outcome. Americans' opinions about the best approach for the U.S. to take with Russia also vary by their level of attention to the election story. A majority of those following the story very closely, 53%, say it is more important that the U.S. should take strong economic diplomatic steps against Russia, while 38% believe the U.S. is better served trying to improve relations. In contrast, those paying less attention to the story say it is more important that the U.S. try to improve relations. Democrats widely believe Russians interfered in the 2016 campaign and that it changed the outcome of the election (78% say this), presumably by helping Trump defeat Hillary Clinton. Just 9% of Republicans agree that Russians interfered and changed the outcome of the election. Rather, the majority of Republicans, 58%, believe Russia interfered but it did not change the outcome. Nearly one in three Republicans reject the idea that Russia interfered. By a better-than 3-to-1 ratio, Republicans believe the U.S. should continue to improve relations with Russia as opposed to taking strong steps against it, presumably taking their cue from Trump. Democrats are almost evenly divided, with slightly more saying sanctions are more important than continuing to improve relations. A majority of independents say it is more important to improve relations. Although U.S.-Russian tensions continue to simmer, more Americans are inclined to believe the U.S. is better off trying to improve relations with Russia. Americans are largely convinced that Russia interfered in the 2016 presidential election but are divided, largely along party lines, as to whether that country's involvement changed the outcome. Russian involvement in U.S. elections is one of many incidents, along with Russia's annexation of Crimea and its backing of the Syrian government in the civil war in that country, that has contributed to the greater tensions between Washington and Moscow. Americans, who viewed Russia favorably for the better part of a decade after the breakup of the Soviet Union in the early 1990s, have had a decidedly negative opinion of it for the past five years. 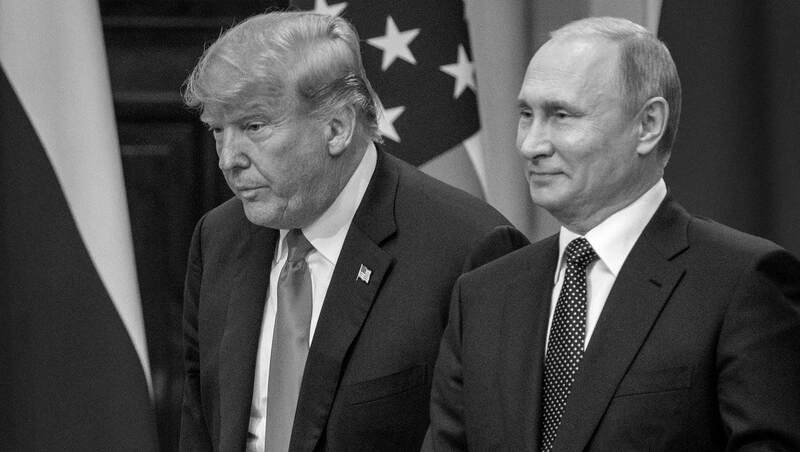 The recent Trump-Putin summit may have been designed to improve U.S.-Russian relations, but the event was overshadowed by Trump's apparent siding with Putin over U.S. intelligence officials about Russian involvement in the 2016 election. Trump has invited Putin to another summit, this time in the U.S., but those plans are on hold. Americans would likely have low expectations for the results of a second summit, as their opinions about Trump's handling of Russian relations are quite poor: Only 35% approve of the job he is doing, worse than their opinion of how he is handling other issues. Republicans are more likely than Democrats to consider Russia an ally or friendly to the U.S., 40% to 25%.